1. Preheat the oven to 200°C, gas mark 6. For the topping, combine the oats, desiccated coconut and maple syrup in a bowl, then spread out on a small parchment-lined baking tray. Bake for 6 minutes, stirring halfway, until crisp and golden; set aside. 2. 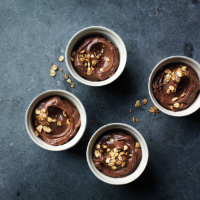 To make the mousse, whizz the avocado, cacao powder, maple syrup and vanilla extract with a pinch of sea salt in a food processer until smooth. Add the coconut milk yogurt and whizz again until combined. (If the mixture is a little lumpy, you may want to pass it through a sieve.) Spoon into 4 small glass jars or ramekins. Eat immediately, or chill for up to 24 hours, adding the topping just before serving.